Animal Love is a silly but highly enjoyable entry in the simian sub Glam/Psych category. It pounds and grunts in sublime heavy fashion. Basically it’s the missing link (get it?) between Hot Legs Neanderthal Man and C.C.S.’s Primitive Love. In fact the Darwinian progression is so neat, I just had to post the C.C.S. track as well –enjoy those devilish jungle horns over the mother of all primitive stomps. Animal Love has the best grunts (and sheep noises! 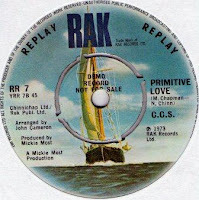 ), but Primitive Love might be heavier and adds a more focussed bouncing gold medallion dimension to the proceedings. 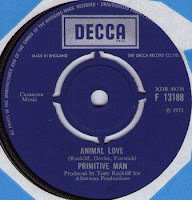 picked up a copy of "animal love" recently -- ace tune.